When comparing Wix vs. WordPress, the key differences between the two website-building platforms are price, features and ease of use. WordPress is a free open-source platform that can be sculpted into any kind of website. Wix is a subscription website builder, starting at $11 per month for businesses. Wix does not have nearly the same functionality as WordPress, although it is much easier to use. WordPress is a reliable giant in the business world because it has such a vast community of developers and can support just about any feature you might need. As an open-source platform, it’s also inexpensive to set up — hosting costs as little as $3 per month via Bluehost — although the installation and setup process is more complex compared to Wix. Wix is a drag-and-drop website builder that works especially well for beginners and crafty users who want a unique website. The editor is simple and incredibly flexible, providing full freedom to design web pages with photos, shapes and text. However, Wix does not have nearly as many business features and integrations as WordPress, and it tends to run more sluggishly. A Note to Fit Small Business Readers: If you’re looking for a simple, low-cost business website, we designed free WordPress themes specifically for small business owners. Our goal was to combine the cost savings and scalability of WordPress with the simplicity of do-it-yourself site builders like Wix. Both Wix and WordPress have free versions that let you build a personal website or blog. These free versions require you to use a subdomain, such as YourSite.WordPress.com, and limit your integrations and features, so they’re not ideal for a professional website. For a full-blown website, WordPress tends to be less expensive since you only have to pay for hosting. This costs as little as $2.95/month through Bluehost whereas Wix costs at least $11/month for a business site. Note: Wix also has a $5 starter edition, which allows you to connect a custom domain — but requires you to display Wix ads — and a $25 VIP edition that provides priority customer support. While Wix has a wide range of products available, most businesses will need to use the Unlimited edition for $14/month, or the eCommerce edition if you want to sell any products. The Combo edition limits you to 2 GB of bandwidth, which means only 1,000 visitors per month, or even fewer if you have a lot of high-resolution photos. The free and starter editions require you to display Wix ads, which is not ideal for a professional business website. See a full comparison of editions in our Wix review. Since WordPress is a free open-source platform, the only thing you have to pay for is hosting. This can be purchased from many different providers. The “official” hosting service at WordPress.com has a limited free version and a low-cost Personal edition, both of which limit your site to basic blogging and informational pages. Our recommended provider is Bluehost since you get a complete version of WordPress with full access to themes and plug-ins. The monthly price is lower than the other providers — starting at $2.95 per month. 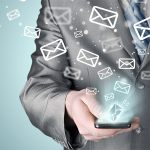 As a bonus, you get up to five professional email accounts and a custom .com domain. If you’re interested in trying out Bluehost, we have a full guide on how to set up a WordPress website with Bluehost. You can also check out our article on WordPress pricing for a full overview of hosting, theme and plug-in costs. While Wix and WordPress are both user-friendly, Wix is better for beginners. Each provides a simple graphical interface to design your website without any programming required. Wix, however, has a much more intuitive editor. To add, say, a photo or text box, you simply drag it onto your site, positioning it wherever you please. At times, this makes the intimidating task of designing a website as simple as creating a PowerPoint presentation. Wix has one of the easiest and most versatile website editors in existence. First, choose from more than 500 free templates, including many business and e-commerce themes. Then, simply click to edit anything on the page. Whereas WordPress tends to limit how much you can edit without custom code, Wix lets you alter pretty much everything. You can drag elements anywhere on the page, change font styles and colors at whim, and even edit the mobile version of your website separately from the desktop version. This makes Wix more flexible, even compared to other drag-and-drop web builders Weebly or Squarespace. While Wix is perfect for the hands-on user who has a specific vision for their website, there is a downside to the high level of flexibility. The code Wix websites are built on tends to be a bit more complicated, and thus, take longer to load. Furthermore, the editing process can be cumbersome for those who aren’t so graphically minded. To see what users have to say about the Wix site editor, check out our full Wix review. The WordPress editor is far more rudimentary compared to Wix. Most editing occurs on a text-based menu where you input your website text, photos, colors and formatting preferences. WordPress site editor: Change settings on the left, and watch your website update in real time. Featuring Fit Web Themes: Salon Edition. For the visually oriented user, this can be frustrating. After picking a theme, you generally have minimal control over the formatting since design elements like shapes and buttons tend to be hard-coded. On the other hand, WordPress websites can often be created faster and with less chance of errors than Wix sites because you aren’t fiddling with each element’s size and positioning. For example, our Fit Web Themes WordPress templates have all the essential business features included by default, so you can simply input your business information and your site is good to go. 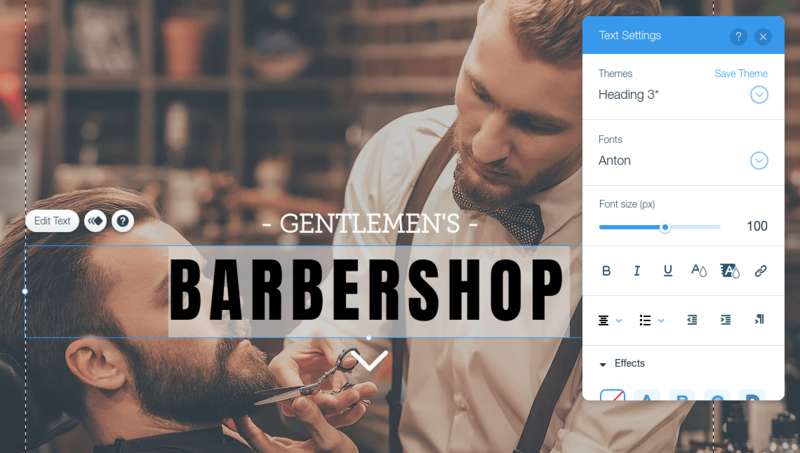 If you’re considering a WordPress website, be sure to check out our free themes, including Business Edition, Restaurant Edition, and Salon Edition (pictured above). WordPress’ e-commerce platform WooCommerce is the most popular e-commerce system in existence. It’s used by roughly 22 percent of all online shops in the world while Weebly accounts for about 5.5 percent, according to Datanyze. The reason WooCommerce is so popular is the same reason as WordPress: It’s free to use and has a huge range of free and paid add-ons that allows your store to do just about anything you need. Wix’s e-commerce store is more basic and requires the upgraded $17 per month edition to set up. However, it tends to be a bit easier to use than WordPress, which is it’s been embraced by a substantial portion of online stores. Starting at $17 per month, the Wix eCommerce edition is easy to use and has a good range of features. I especially like “Quick View,” which shows product information at a glance. It’s handy and really gives your store the impression of a bigger enterprise. 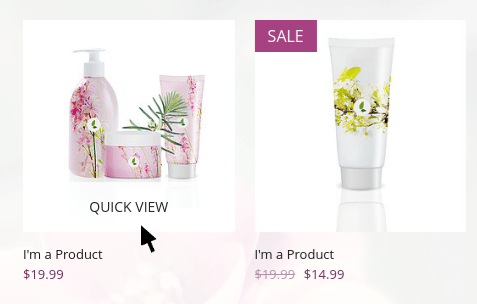 Wix “Quick View” displays product information and allows visitors to add to cart without leaving the page. Wix includes a manual shipping and tax calculator with the option to set up a real-time calculator powered by USPS. However, unlike WordPress, automatic tax calculation and abandoned cart recovery are not supported. My other gripe with Wix is the limited display options. In particular, there’s no keyword search for products, and you cannot move the filter bar away from the left corner. These are subtle limitations, but it was enough to make me ultimately move away from Wix for an e-commerce store. Compared to Wix, the WordPress e-commerce system, known as WooCommerce, gives you much more control of your online store. You can choose from a huge range of templates and fully customize how your products are displayed and organized. 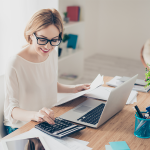 Using extensions, you can add many features Wix is unable to support, including a product search bar, tax calculator and abandoned cart recovery. In all, there are almost 300 WooCommerce extensions that add extra tools and integrations to your online store. WooCommerce is completely free to install — another attractive element considering Wix’s $17 per month fee. On the other hand, some WooCommerce extensions can get expensive, so you might still be paying a lot for an advanced online store. Plug-ins provide functionality to your website beyond the standard features. Some examples include contact forms, social media feeds and SEO tools. Plug-ins can also be used to integrate other business systems. For example, a restaurant may want to integrate its ordering and reservation systems, a salon its appointment booking or a retail shop its inventory software. In all these cases, the plug-in lets visitors interact more substantially with your business and reduces the manual data copy on your end. WordPress is the clear winner in this category. They have nearly 50,000 free and paid plug-ins, covering just about every feature and integration imaginable. Wix has a modest 200 plug-ins (known as “apps”), which provide a good range of features. However, if you’re looking for a specific feature or integration, you’re much more likely to find it with WordPress. Performance includes your website speed and reliability: How quickly pages load, and how often (or rarely) they go offline. WordPress, when powered by Bluehost, tends to perform a lot better than Wix. During our test, pages loaded over 3x faster. WordPress websites also had a slightly better uptime, although both performed well in this category. Having an uptime of 99.95% means your website is offline only 0.05% of the time. Server performance depends on your host provider. We tested using Bluehost, our recommended WordPress host. Wix has generally stronger customer support, mainly because everything is rolled into one package. Support agents can answer questions about hosting, domains, templates, the site editor or installing apps. With WordPress, you’ll likely need to call different companies, depending on the issue. On the other hand, WordPress is so widely used, there’s a vast user community willing to respond to questions. You can also simply Google your question to find one of the many free support resources. For example, we have detailed support guides for all our Fit Web Themes WordPress themes and provide one-on-one support via our Q&A forum. Most themes and plug-ins will provide free resources as well. WordPress is generally better for business websites because it offers so much flexibility via plug-ins. As a restaurant, you can integrate your ordering or reservation system. 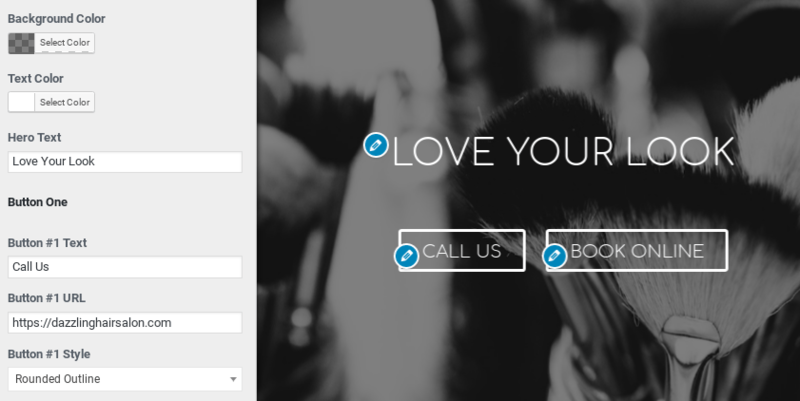 As a spa or salon, you add an appointment booking system. While this is also possible to do with Wix, you have fewer software options and may not find the exact system you prefer to use. Another important caveat to WordPress is that there are thousands of different companies that design themes and plug-ins. All the benefits of WordPress go out the window with a poorly designed theme, so it’s essential to read user reviews and try out free versions before making a purchase. We recommend checking out our own free WordPress themes designed by us at Fit Small Business, including Business Edition, Restaurant Edition and Salon Edition. Our themes are actively supported, and we’re happy to provide help via our Q&A forum. The Wix is pretty good but not very convenient tools for creating forms and delivery calculators. In this regard, WordPress has quite a lot of different ready-made solutions in the form of plug-ins, for example, from simple Contact Form 7, for more complex and individual solutions there is a uCalc plugin. The rest of the Wix is a good platform, except for the price. WordPress is free to use and more economical if you buy or order themes and plugins. Any new recommendations or updates to your April, 2014 post that you would like to share? It appears that http://www.lcrlakegaston.com/#!lake-gaston-homes-for-sale/cdvz is now live on Weebly (and no longer a WP site). I am responding for David. Yes, his Father’s website is now a Weebly site. You can see how he did it by checking out our 8-day course on building marketing a killer real-estate website. The whole process is explained in-detail. Thanks for this article, I have a wix website and have been pretty happy with the ease of use and options but there are a few technical issues that I am dealing with and I am not happy with the mobile options. I originally used the wix site as a portfolio site (I make quilts) since it is very easy to design, add content, blog, and build galleries but I am now wanting to add a store option so I am still looking in to seeing if wordpress might be a better option because of the issues you stated in the article. I am afraid I will have to hire a designer though because wordpress seems very complicated to me so that is what is holding me back at the moment. I’m still not decided but glad I found your website and will continue to follow your articles. Sounds good Kathleen thanks for reading and for the compliment. You may also want to check out Weebly. Ease of use is similar to Wix but does not have the technical issues. That is definitely a bummer about WIX not having mobile editing. WordPress does. You can write blog posts, manage your comments, and much more using your mobile device. I hope that is helpful! Terrific article and loads of fascinating follow up comments. I used WIX to build our house sitting and pet sitting website and certainly it was easy to build and I’m happy with the look. We’ve only had the site up for a couple of months and are page 3 on Google for a key search term such as ‘long term house sitting’ but obviously still a long way to go. I’ve been doing regular blog articles on our experiences and the thing that irks me about the WIX sites is the lack of an option for anyone who likes your blogs to ‘follow’ you other than using an RSS work around. You’d really think WIX would have a simple ‘follow’ button. Thanks for reading and for the comment. Best of luck with the site if there are any questions we can help with let us know! Thanks for your article. Really appreciate your comparison breakdown. I started on Wix in December of 2014 (didn’t publish until February 2015). Originally, I wanted a simple recipe website, and now it has turned into a blog and I have to say, I have the same observation as Colin. Obviously I have some issues with Wix, as I reached your site by a Google regarding these two platforms. Wix is greatly improving it’s capabilities, even since I have been a customer. I keep holding out because I dread a switch, yet I do see the benefits of WP. Still torn, and with not a lot of time on my hands, I want to like Wix. For the record, they are improving incredibly by the day. Again, thanks for the insights! Sure thing Sarah. Thanks for sharing your experience as well!